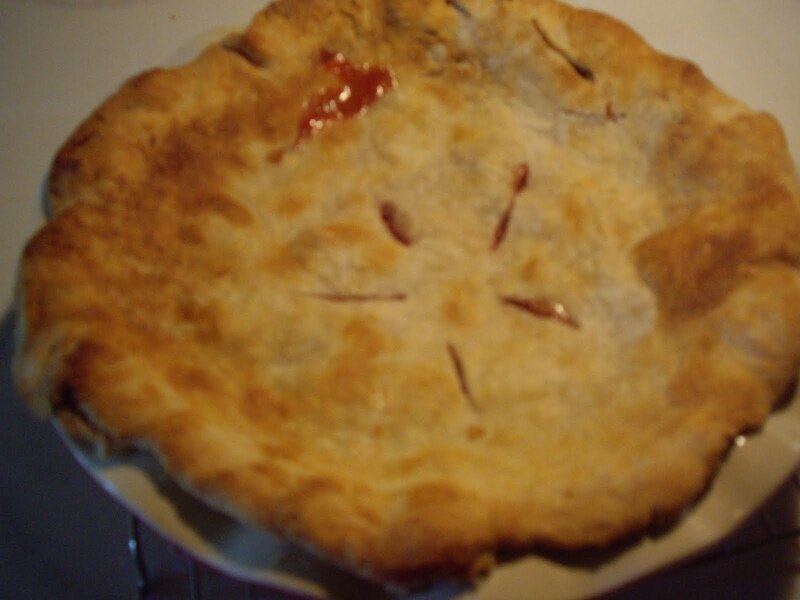 Strawberry-rhubarb pie is a classic. Both fruits are in season right now, so why not put them together? In this recipe, I give two amounts for the sugar. If you like your pie less sweet, use the 3/4 cup. If you like it good and sweet use the full amount of 1-1/2 cups. You will need a 9″ pie plate. Combine sugar, flour, salt, and nutmeg in a large mixing bowl. Add the rhubarb and strawberries and toss. Let sit for 20 minutes. Put bottom crust into pie plate. Pour fruit mixture into the crust. Cover with top crust and seal. Make 5 slits on top to allow steam to escape during baking. Bake for 40-45 minutes until the filling is bubbling thickly. Let cool for at least a few hours for the pie to set up. A REALLY GOOD PIE! I ENJOYED IT VERY MUCH!